The document UFS Compliance Test Matrix Revision 1.0 is no longer available in the Public area of the UFSA website. To access the current revision, please email info@ufsa.org. The document Test Tool Requirements Revision 1.0 is no longer available in the Public area of the UFSA website. To access the current revision, please email info@ufsa.org. The document UFS Logo Usage Guidelines March 2016 is no longer available in the Public area of the UFSA website. To access the current revision, please email info@ufsa.org. 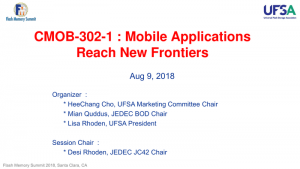 Click on the image below to view the August 9, 2018 Presentation. Click on the image below to view a 2-page PDF copy of the UFSA brochure. Click on the image below to view a 4-page PDF copy of the UFSA FAQs.